Suwon , Park's home town in South Korea, has unveiled a road named after him, Park Ji-Sung Road, to honour his contribution to the South Korean national team in the 2002 World Cup - the first instance of such an event for a living footballer in South Korea. Suwon (Suwon-si) is the largest city in Gyeonggi Province, South Korea . It is also the provincial capital. 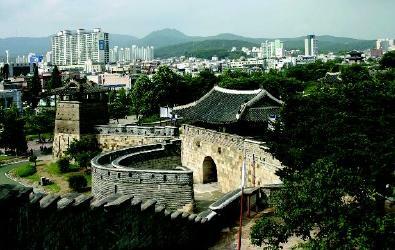 Suwon is approximately 30 kilometres (20 miles) south of Seoul . The city can be reached from downtown Seoul in under an hour. Suwon is sometimes called the capital of Korean football because the popularity of the Suwon Samsung Bluewings . King Jeongjo made an ultimately unsuccessful attempt to make Suwon the nation's capital in 1796 with the construction of Hwaseong, a fortress wall running around the entire city intended to guard the tomb of his father which he had located there. The fortress was constructed under the guidance of philosopher Jeong Yag-yong , and still exists today. It is a designated UNESCO World Heritage site. The walls once encircled the entire city, but recent urban growth has seen the city spread out far beyond the fortress. Institutions of higher education in Suwon include Ajou University , Dongnam Health College , Gukje Digital University , Hapdong Theological Seminary , Kyonggi University , Kyunghee University , Sungkyunkwan University , Suwon Catholic University , Suwon Science College , Suwon Women's College , and the University of Suwon . In addition, the agricultural campus of Seoul National University is located in the city. Suwon is home to the Suwon World Cup Stadium , a venue during the 2002 World Cup tournament and home to K-League defending champion Suwon Samsung Bluewings . The city is also home to Korean Baseball Organization team Hyundai Unicorns. Suwon is also home to many foreign language teachers, the vast majority teaching English. This large expatriate community is spread throughout the city, with a particularly high concentration in the Yeongtong-dong district. Suwon is a regional transportation hub and an important stop on the Gyeongbu railway line going from Seoul to Busan , although the new KTX high-speed train has changed things slightly. Suwon is connected to Seoul with city and express buses and also the Seoul subway network.